Stir all ingredients together. Serve on a roll or bread. This salad, while simple to make, is one of the tastiest in my repertoire. I like to think of it as sort of a cross between a club sandwich and a classic shrimp salad. 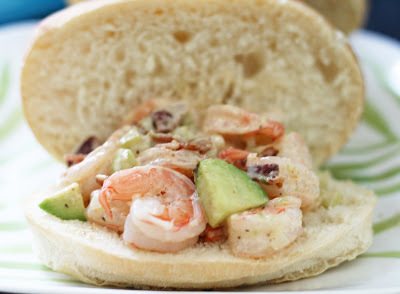 The creaminess of the avocado contrasts nicely with the shrimp and smoky bacon. A yummy change from the everyday. Steam or boil the sausages until hot. Allow to cool slightly then slice into coins. Heat the oil in a wok or skillet. Saute the onions, garlic, chiles, sausage, mushrooms, ginger and the pineapple until fragrant and warmed through. Add the snow peas and cabbage. Stir fry until crisp-tender. Add the rice and saute until all clumps are gone. 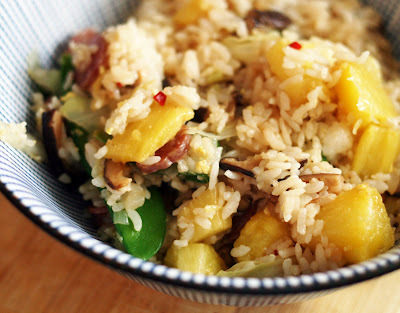 Create a well in the middle of the rice and break the egg into it, scramble it until cooked and stir it into the rice. Add the sauces. Toss until the sauces are evenly distributed. Serve immediately. Matt whipped this up for lunch the other day and it was so tasty, I had to share. The flavors are fresh and the whole dish is surprisingly not greasy or overly sweet. It hits that perfect note of sweet-salty-spicy that many dishes aim for but miss. It is also a great dish to use up any leftovers you might have, we used cabbage and snow peas because we had that on hand but broccoli or carrots or even bok choy would be quite tasty. Stir together the milk, water, butter, sugar and salt in a saucepan. Bring to a boil then remove from heat and allow the mixture to cool to lukewarm. Meanwhile, saute the onions in the butter until soft and translucent--do not brown. Allow to cool. In a large bowl, whisk together the flour and yeast. Pour in the milk mixture and stir until the dough starts to come together, adding more water of the mixture looks dry or more flour if the mixture looks wet. Add the onions. If you have a stand mixer, use the dough hook to mix for about 8 minutes. If not, knead the dough on a floured surface for about 10 minutes. Place the dough in a greased bowl. Cover with a towel and wait until it has doubled in size, about 1 hour. Punch down the dough and divide into 6* even portions. Make tight balls out of the dough by pulling the dough towards the bottom and gently stretching until a ball with a smooth top forms. Place seam-side down on a baking stone or metal baking sheet. I actually just used my silipat and baking sheet. Allow the rolls to sit for a minute. 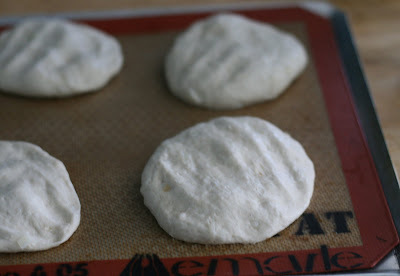 Flatten each dough ball with your hand or the back of a large spatula until it is about 3 to 4 inches wide. Cover the rolls with the towel again and set aside until they have just about doubled in size, about 30 minutes. Meanwhile, preheat the oven to 400. Whisk together the water and yolk to make the egg wash. Brush onto the tops of the rolls. Sprinkle with seeds if using. 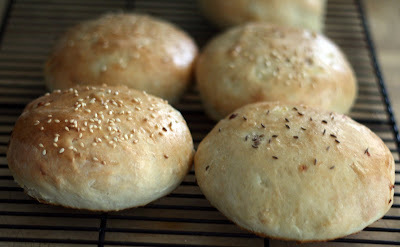 Bake for about 15 minutes or until golden brown on both the top and the bottom and when tapped, they sound hollow. Allow to cool, then slice. There are lovely hamburger rolls. Soft but sturdy and solid enough to support a serious burger and with a superb yet not overpowering onion flavor. 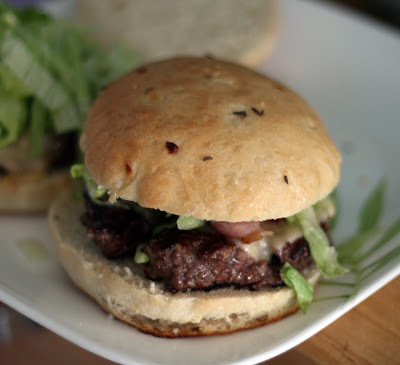 I love making homemade hamburger rolls when we have burgers because they really take little in the way of effort but they taste so much better than store-brought. The fact that everyone is always impressed when you tell them you made the rolls is just a little bonus. Whisk together all of the dressing ingredients or pulse them quickly in a blender or Vita-Mix)until a emulsified dressing forms. Drizzle over the salad ingredients and toss gently. I like to allow it to sit for 1 or so hours before serving. Serve at room temperature and refrigerate any leftovers. I've been thinking about three bean salads for a while now. I read a mention of one on a nonfood blog I read and vaguely remembered my mother eating a(jarred) three-bean salad when I was a child. I sort of remember it being sweet & pickley and not liking it. 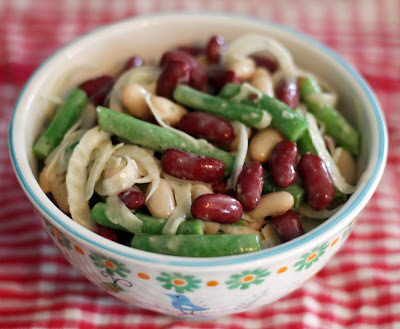 I still wasn't sure about the sweet + pickled part of it but a salad made with my favorite beans was appealing. I noticed I had some fennel slowly decomposing in the fridge so on impulse I sliced it up (and my finger on my mandolin, ow) and it really was the perfect addition. Rather than going down the sweet and pickled route I made a very fresh tasting Italian-inspired vinaigrette. I think this might be my new favorite cold salad: simple, delicious and rather impressive looking. Update: I am happy to say that the salad was just as tasty today as lunch as it was yesterday as a side dish for dinner. In a small bowl, whisk together the dressing ingredients. Pour over the vegetables, carefully stir to combine. Refrigerate 1 hour before serving. This potato salad makes the most of what spring has to offer; new fresh radishes, carrots and celery and tiny potatoes. 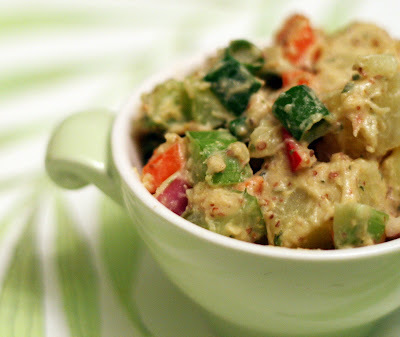 I hate making side dishes so this potato salad is perfect for me, it packs in a huge amount of vegetables with minimal effort. Not to mention that the dressing is quite zippy thanks to the horseradish and mustard making it no ordinary potato salad. A potato salad for potato salad haters. 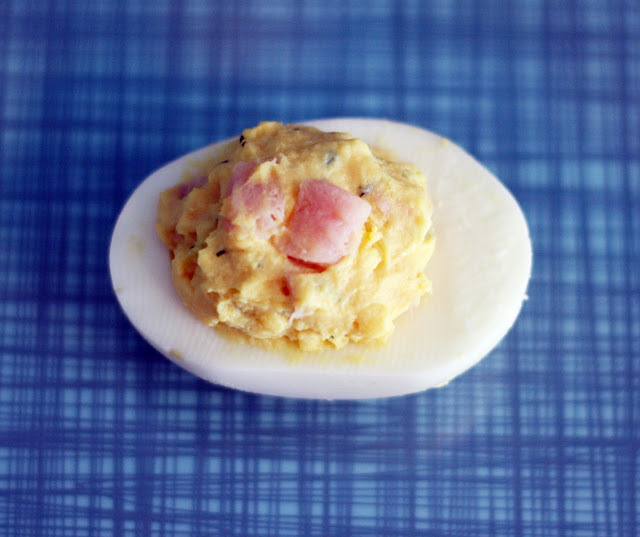 Terribly tasty, incredibly easy. Four days before you want to make the bread, place all of the ingredients for the starter in a large bowl. Stir to combine. Cover tightly with plastic wrap. Let sit on the counter for 2 full days. On the morning of the third day, place in the refrigerator. Then, right before you go to bed that night, combine 1 cup of the starter, the two cups of rye flour, and one cup of warm water in a second large bowl. Cover and leave out on the counter overnight. If you want to keep the starter going, add 1/2 cup warm water, 1/4 cup flour and 1/4 cup rye flour to the starter bowl and keep refrigerated until the next time you want to use it. Scrape the contents of the bowl that has been sitting out overnight into the bowl of a stand mixer. Add the remaining bread ingredients and mix, using the dough hook, until a firm but fairly malleable dough forms. Add more water, a tablespoon at a time, if the dough seems very dry or more flour if it seems wet. Knead by hand or in the machine until a ball forms. Place in a large, buttered bowl. Cover with a towel until it doubles in bulk, about 1 1/2 to 2 hours. Punch it down and divide into two equal halves. 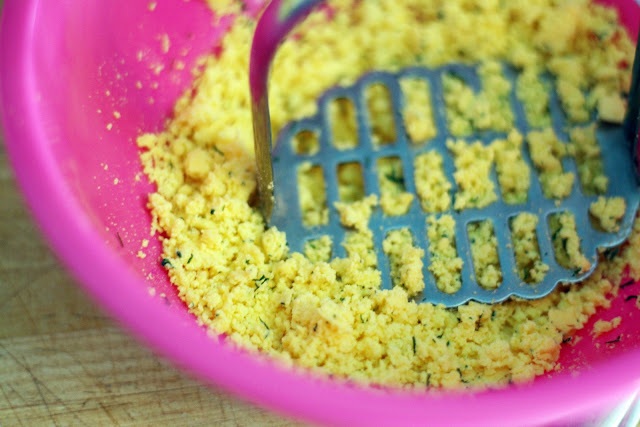 Sprinkle a buttered or lined baking sheet with cornmeal. Shape into 2 rounds and place on the baking sheet. Alternately, butter 2 standard loaf pans and sprinkle them with cornmeal and place the dough in them. Or mix it up and make one of each. Cover and allow to rise for 1 hour or until doubled in bulk again. Meanwhile, preheat the oven to 375. Beat the egg and water together for the egg wash, brush over each loaf. Bake for 30 minutes or until brown on top and it sounds hollow when tapped. Cool on a wire rack before slicing. I admit this seems like a long, drawn out recipe. However, it is not terribly difficult and the results are amazing-the closest to deli rye I have ever had in a homemade bread. I have to warn you that it is a pretty stiff dough to work with, even if the final product isn't overly dense. 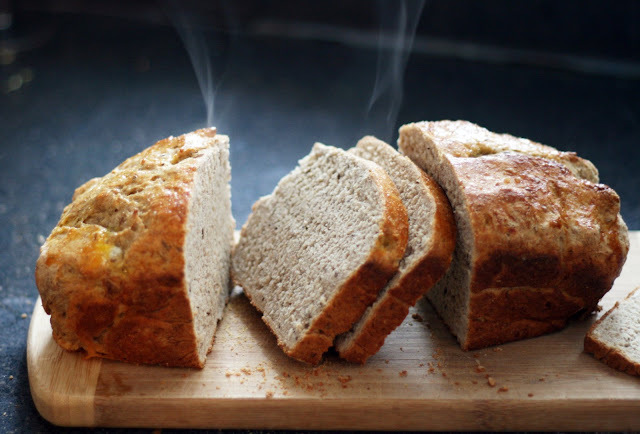 Rye flour doesn't have much gluten so it won't be as soft or stretchy as bread made with plain flour. Personally, I found the dough much easier to knead in my KitchenAid using the dough hook than to knead it by hand. Someone with a little more upper arm strength might have an easier time than I did. I do think it was worth the effort. It was the perfect bread to have with some homemade corned beef and mustard. It also made excellent toast. 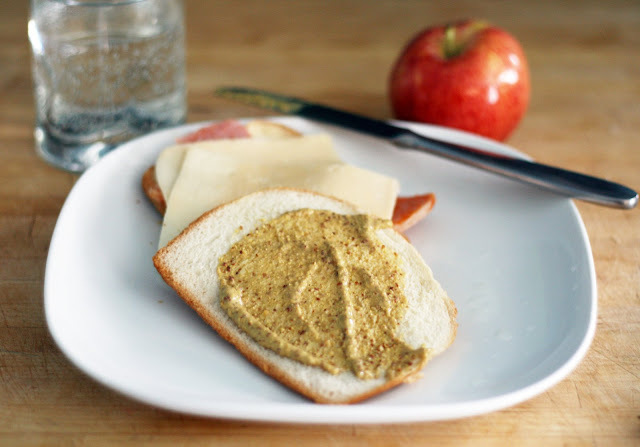 Pour the dry mustard, mustard seeds and 1 cup of water into a nonreactive bowl. Refrigerate overnight. The next day, pour the remaining water, garlic, vinegar, sugar and spices in a saucepan and bring to a rolling boil. Continue to boil until the mixture has reduced by about a quarter. Strain into a food processor or blender (I used my Vita-Mix)add the mustard seed mixture and malt syrup. Blend until fairly smooth. Decant into jars. Refrigerate at least overnight before using. After my earlier success with a spicy & sweet mustard I knew I would want to make mustard again. After I decided to corn my own beef, it only seemed logical to make my own grainy mustard. Well, logical to me anyway. I am sure not everyone makes their own condiments and deli meats on a regular basis but I figured if I was going to cure my own meat (no matter how easy it was) I might as well make something special to go with it. 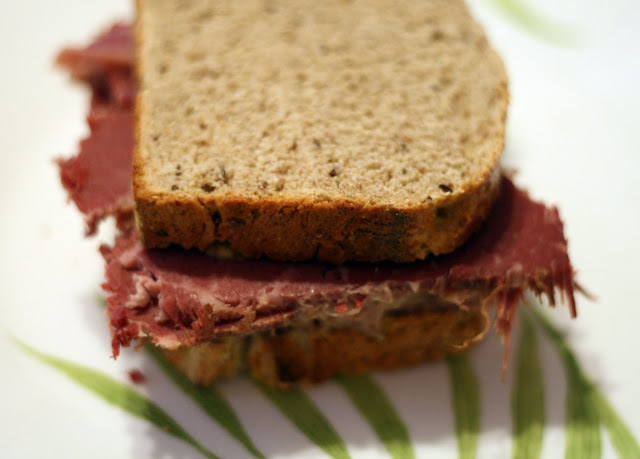 I love a good corned beef on rye and one of the essential ingredients of this sandwich is a good quality deli mustard. Like the first mustard I made, this one was extremely easy to make and will keep for a long time in the fridge* insuring that I will have tasty sandwiches for weeks to come. 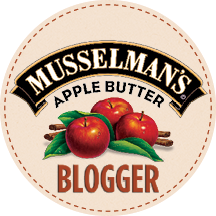 The flavor is a bit sharper and brighter than commercially produced deli mustard and is perfect on a corned beef sandwich or coddie. Or a hot dog. Or really anything you'd want deli mustard on, this is really, really good mustard! *I still have a bit of the mondo batch of the sweet & spicy mustard I made in December and it tastes exactly the same as it did the day I made it. 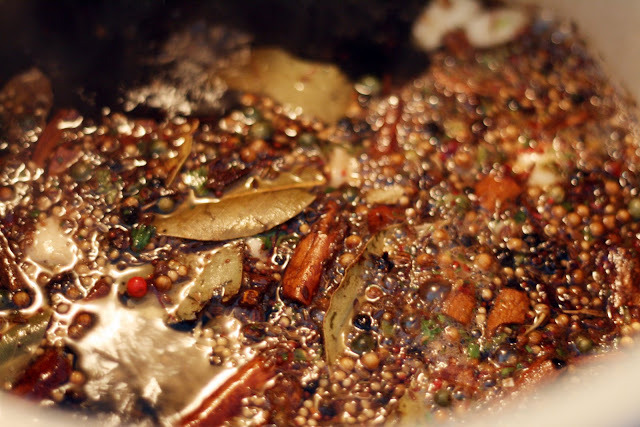 Place the brine ingredients in a large pot. Bring to a boil. Boil for 5 minutes. Allow to cool completely. Pour into a large, non-reactive, air-tight container. I cannot recommend this container enough. It was the perfect size and believe me, it is harder to find a container that was actually air-tight and big enough to hold quarts of brine and a large cut of meat than you would think. Weigh down the meat with something non-reactive and heavy. 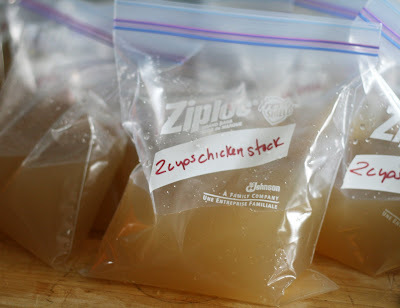 I used a gallon-sized plastic resealable freezer bag filled with cool water. Refrigerate. Once a day, flip the meat, re-weigh it down and continue refrigerating it. This is to make sure both sides are evenly brined. After 12 days, remove the meat from the brine. Discard the brine. Add the meat and the cooking spices to a very large (I used this 16 quart lobster pot)pot and fill with water. Boil for 3 hours or until the meat is tender and sort of flakes when you poke it with a fork. Allow to cool. When cool, scrape off any loose bits of fat and discard them. Slice the meat across the grain with a very sharp knife or meat slicer. I borrowed this meat slicer and it worked pretty well slicing the meat to deli-thinness. *Sometimes called "pink salt" or "curing salt" this is a perservative that helps the meat retain the pinkish color. I had a hard time finding it locally but I finally found it for sale from this website. 8 oz is only $2 and is enough for dozens of curing experiments. 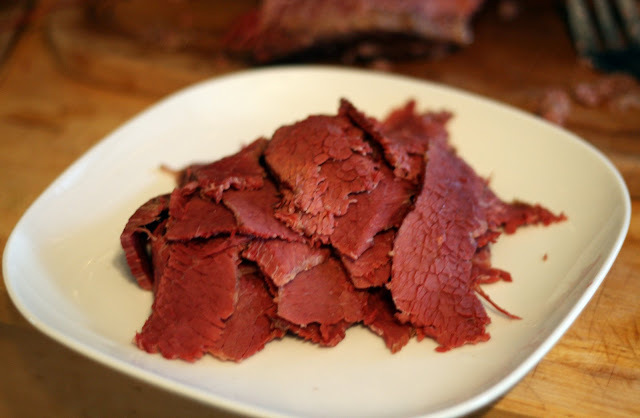 There were times when I was making the corned beef I felt slightly insane. 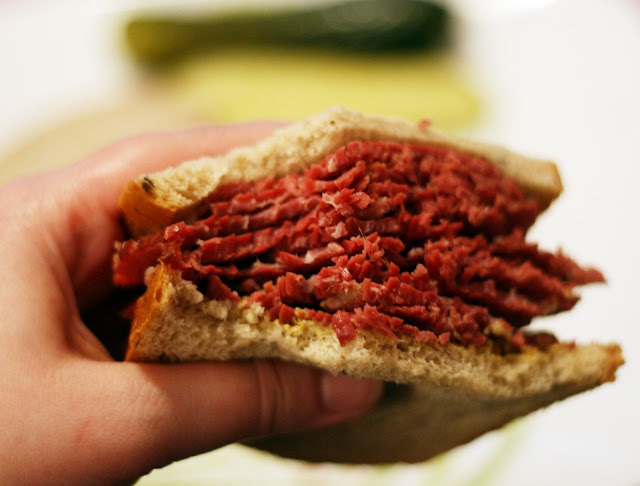 After all, I am lucky enough to live in a city with a good deli so it wasn't 100% necessary that I make my own corned beef from scratch. Luckily, after the weeks long, insanity inducing hunts for a brining container and sodium nitrate were over, the actual corning of the beef was really easy. Really, really easy. 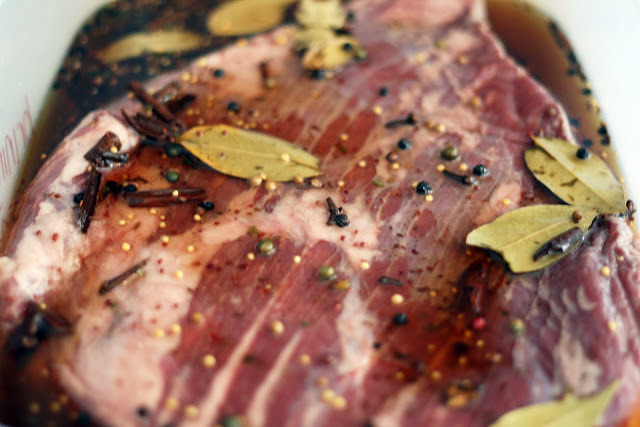 The brine was simple and while flipping the meat every day was one more thing to remember it wasn't time consuming. At the end of the 12 days you just boil it until tender. I wasn't sure what spices exactly went into corned beef the few recipes I could find that didn't call for pre-brined meat just called for "pickling spices". 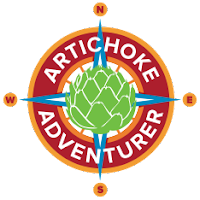 What exactly was in those pickling spices wasn't really clear. So I just picked spices that I thought would make for tasty meat and hoped for the best. I then waited a long 12 days to try it and well, it totally worked. It was the best corned beef I have ever had and I have had a lot of corned beef. It was melt in your mouth tender and had the most perfect straight-from-the-deli flavor. Well worth the effort. 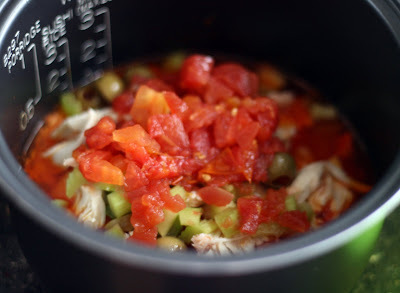 Place the chicken and the vegetables in a large (8-10 quart) stock pot. Add water until the pot is nearly filled. Periodically skim off fat as it floats to the top. After about 3 1/2 hours, strain into a large bowl. If you want it super clear strain through a paper towel lined colander. Cool immediately by placing the bowl in an ice filled sink. Never place the hot stock directly in the fridge or you run the risk of rapid bacteria growth which may result in food poisoning. Refrigerate overnight, then skim off any fat that rose to the surface. Package in air tight containers or freezer bags to store. I suggest freezing any stock you don't use right away. In if freezer bags, lay the bags flat so they freeze in a shape that takes up the least amount of room. 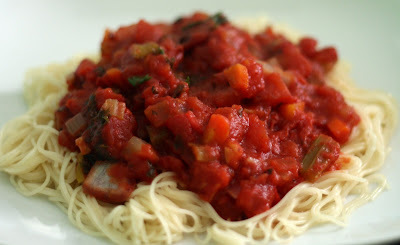 To defrost simply remove the block of stock from the container and place it in a sauce pan. Heat on low for 3-5 minutes. Add ginger and/or galangal and extra garlic and green onions to the mixture if using it in a Thai, Japanese or Chinese dish for extra flavor. Alternately, add these ingredients into the pot when defrosting plain chicken stock, simmer for 5 additional minutes then strain them out. Similarly, if making Mexican or other spicy food, add dried chile peppers, extra garlic and/or onions to the stock or when defrosting. Add some whole spices or herbs (bay leaf, peppercorns, thyme, rosemary etc) to the mixture. Roast the chicken carcass in a 350 oven for 15-30 minutes before tossing it in the pot. This helps intensify the flavor. Add some whole, skin-on raw chicken legs or wings for extra flavor. Makes about 5-6 quarts of stock. 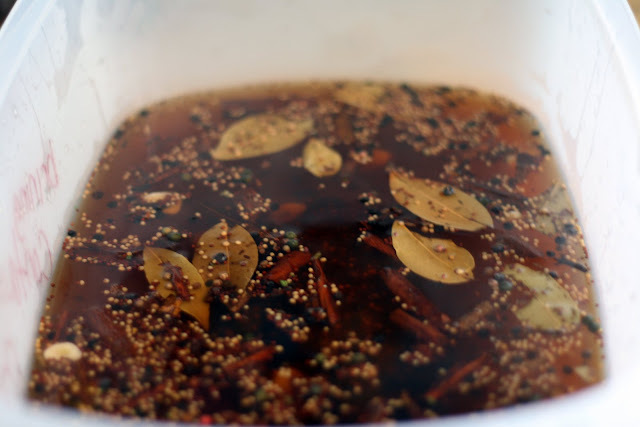 Stock is so basic, I almost feel odd posting a recipe for it but I use it so much when cooking and I've received numerous requests for a guide on making it, I gave in. It truly is simple but delicious. Much better tasting then what you can buy in the store. It is also much cheaper. A box of our favorite store-bought stock is nearly $4. The chicken I used was $6 (on sale) yielded more than two meals worth of meat and over 6 quarts of stock. You really can't beat that! 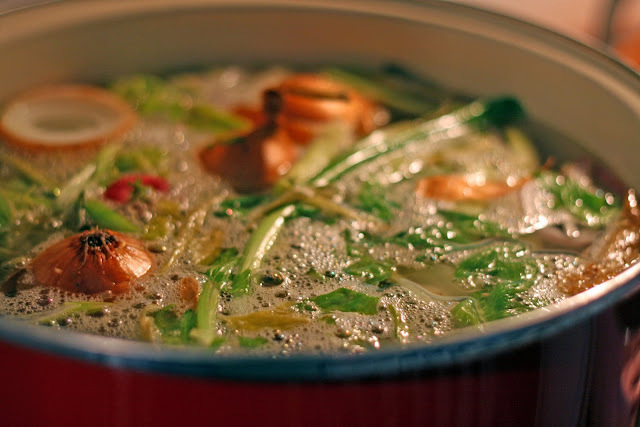 Save odds and ends of vegetables (a carrot top, celery leaves, bruised green onions etc) in a container in your fridge or freezer to add to the pot when you make stock. The whole vegetables add a lot of flavor but every bit helps! Line a 8x8 inch baking pan with parchment paper or lightly spray with cooking spray. Using a mixer, mix all ingredients except the food coloring together until the coconut is evenly distributed. The mixture will be very thick. Divide the mixture in half, press one half into the bottom of the pan. Add food coloring to the remaining coconut and stir to evenly distribute. Press firmly on top of the uncolored coconut in the pan. Refrigerate about 2 hours or until firm before cutting into one inch squares. Despite the amount of sugar in the cubes, they don't taste quite as sweet as you would think, the coconut keeps it from being too over the top. They are sort of a cross between a coconut cream candy and fudge-dense but chewy. A perfect candy for Easter or Passover. First, please do not use sweetened coconut in this recipe. Secondly, do not reduce the amount of sugar or they will not set up properly. 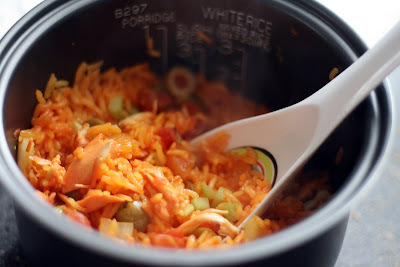 Add the rice and contents of the flavoring packet and the paprika to the rice cooker. Fill with broth (or water) to the manufactures' fill line. Add the remaining ingredients. Close the lid and set to "mixed rice". Stir before serving. Note: This recipe is easily doubled. As is, it serves 1-2. Just to start off, I made this in my very much beloved Zojirushi NS-VGC05 Micom 3-Cup Electric Rice Cooker and Warmer so I can really can only vouch for the success of this recipe in this particular rice cooker. That said, I cannot imagine that it wouldn't work in another rice cooker. This recipe is a variation of a recipe that my husband came up with after hitting on the idea of adding chicken to some rice he was making for the next day's lunch. It started out with just onion, celery, rice and chicken then it evolved to include olives and now I added tomatoes. Matt frequently makes it when we have leftover chicken. He just puts it in the rice cooker after dinner, lets it cool then packages it up for lunch the next day. It reheats well. Of course it is also very good straight out of the rice cooker. The rice is perfectly cooked and seasoned as is the rest of the ingredients. Who says a rice cooker is a single use appliance? Place the chicken and marinade in a nonreactive container. Marinate for at least 1/2 hour. Then grill or saute the chicken until cooked through. Cube and set aside. In a large bowl, whisk together the dressing ingredients. Add the remaining ingredients and toss to evenly distribute all of the ingredients. 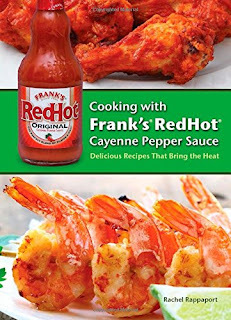 Serve immediately or for better flavor, refrigerate at least 1 hour before serving. 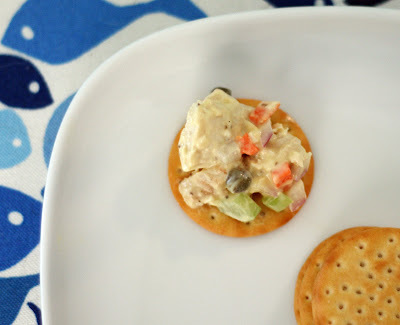 This is my current favorite version of chicken salad; it was so good, I made it a second time in less than a week. The capers give it a salty, pickle-y kick, the radish and red onion lend some spicy crunch and the dressing is creamy but not cloying or too mayonnaise-y. Chicken salad nirvana. 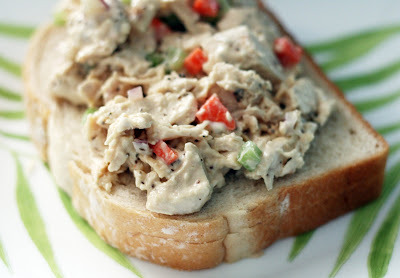 If you are feeling decadent, this chicken salad is particularly good on sourdough bread topped with a couple slices of bacon and avocado.